A few multiple choice questions (for practice) related to magnetic fields produced by current carrying wires are given below. You may solve them yourself and check your answers by referring to the solution given below the set of questions. A straight infinitely long wire carrying a current I is given a 90º bend at the position O (Fig.) near its middle. 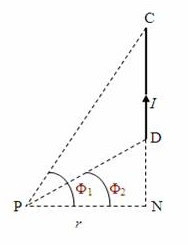 What is the magnetic flux density at the point P (shown in the figure) at distance d from the bend? Two coplanar concentric circular coils P and Q of 20 turns each carry currents of 1A and 2 A respectively in opposite directions. If their radii are 10 cm and 20 cm respectively, what is the magnitude of the resultant magnetic flux density at their common centre? If the coils in question no.3 carry the same current of 2A (in opposite directions), what will be the magnitude of the resultant magnetic flux density at their common centre? 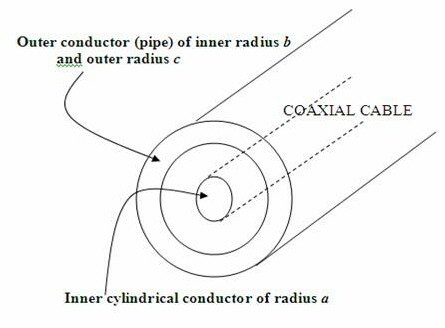 The above questions are meant for AP Physics B as well as AP Physics C.
The following questions (5 and 6) are meant specifically for AP Physics C.
An infinitely long coaxial cable has an inner central cylindrical conductor of radius a and an outer conducting cylindrical pipe of inner radius b and outer radius c (A portion of the coaxial cable is shown in the adjoining figure). It carries equal and opposite currents of magnitude I on the inner an outer conductors. What is the magnitude of the magnetic flux density at a point P outsie the coaxial cable at distance r from the axis? 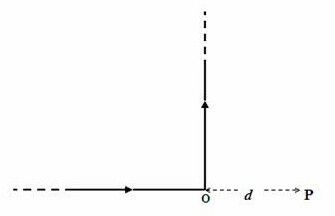 In the case of the coaxial cable of question no.5 above, what is the magnitude of the magnetic flux density at a point P in between the central conductor and the outer pipe, if the distance of the point P from the axis is r? The magnetic fields due to all the four sides of the loop act vertically downwards at the centre of the loop and they add up to produce a resultant field of magnitude 4B [Option (d)]. The magnetic field at P due to the horizontal portion of the conductor is zero since the point P is lying on the straight line indicating the direction of flow of the current. The straight lines joining the point P to the ends of the conductor make the same angles (Φ1 = Φ2 = π/2) so that sinΦ1 – sinΦ2 = 0. Thus B = 0]. The vertical portion of the conductor in the problem produces a magnetic field of magnitude μ0I/4πr directed normally into the plane of the figure [Option (b)]. 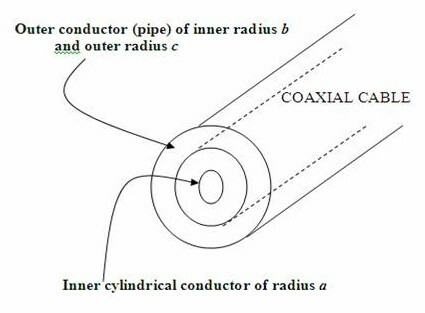 The magnetic flux ensity at the centre of a circular current carrying coil is directed along the axis and has magnitude μ0nI/2a where μ0 is the permeabitity of free space, n is the number of turns in the coil and a is the radius of the coil. ∫B. dℓ = µ0 [I + ε0 (dφE/dt)], where ε0 (dφE/dt) is the displacement current resulting from the rate of change of electric flux φE. ε0 is the permittivity of free space]. We imagine a circle of radius r, with its centre at the axis of the coaxial cable, as the closed curve for the integration. Since this circular path encloses two equal currents in opposite directions, the total current I passing through the surface enclosed by the closed curve is zero. Therefore the magnitude B of the magnetic flux density at a point P outsie the coaxial cable must be zero.